I know that I’ve said I won’t watch Mike Pelfrey pitch but last night I made an exception. Living in Greece affords me very little opportunity to watch the Mets live so I decided to watch anyway. At least I watched the first seven innings and I’m glad I shut down the pc and wasn’t forced to watch the onslaught or listen to the Phillies announcers any longer. The Mets lost to the Phillies by a score of 8-2. It wasn’t very pretty to watch but Pelfrey pitched quite well. After a shaky first inning he settled down and did what the Mets and we fans have asked him to do; which is keep us in ballgames and that is what he did. Ramon Ramirez’ wild pitch and two too many walks from Manny Acosta is what did the Mets in last night my friends. I’m certainly not pissed off at the bullpen…they’ve been great so far this year and I certainly can’t expect them to pitch scoreless ball each and every time they step on the hill. Ike Davis seems to have come out of his coma and collected two hits on the day…including a first inning two run jack that was really nice to see and left the Phillies announcers that I was forced to endure speechless. The fact that these hits came at the expense of the southpaw Cole Hammels should give Davis some added confidence. David Wright continued his hot hitting adding two more hits to his 2012 tally…it’s two bad he got picked off base twice by Hammels, who BTW has an extremely good move to first. 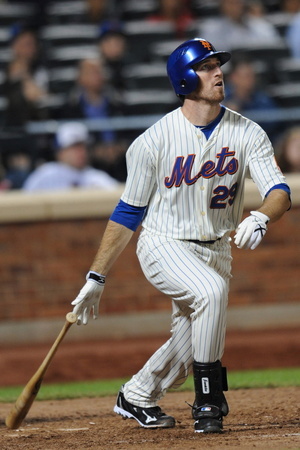 Lucas Duda also collected two hits on the day….good for him! Speaking of disguises Mark Berman, author of Brilliant Disguise will be joining me on Wednesday Night’s Phil Naessens Show to talk all things Mets baseball. While the Mets lost Sunday’s battle they did win the war by taking two of three from the Phillies in Philly. It doesn’t get much better than that my friends! The Mets travel to Atlanta Moday to begin a three game set with the Braves.